When San Francisco’s Rincon Hill neighborhood was slated for redevelopment, the Architectural Foundation of San Francisco challenged students—in its annual competition—to create a fantasy project for Rincon Hill. To re-imagine the city where they’re growing up. Now comes the prospect of an America’s Cup in 2013 and the re-imagining of a neglected waterfront. 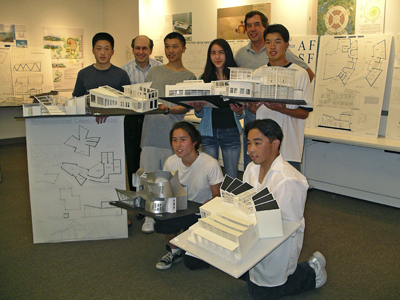 And knowing that much you’ve already guessed that the theme of the AFSF’s 42nd Annual Architectural Design Competition for High School Students is a challenge to design something for the America’s Cup Village. A student pavilion, to be precise. Saturday was orientation day at the AFSF offices in downtown San Francisco, and I was recruited to explain this odd thing that is an America’s Cup. I know of no way to do that, except through the history of the thing, by recounting the adventure of 1851, the nerve of those six guys from New York to build a Yankee schooner and take it to England to race. In the great age of sail. When Britain ruled an empire because Brittania ruled the waves. The newspaper editorials urging them not to go, lest they embarrass the entire country. The electrified response when the upstart Yankee schooner outran the entire fleet of the Royal Yacht Squadron—headlines screaming all across our young republic because those six men had the gall to call that boat, America. I had an audience of twenty-two or so local high school students, a handful of teachers, and the staff of the Architectural Foundation of San Francisco. I proposed to them, as I propose to every audience when I speak about the America’s Cup, that it is much more than a trophy. The America’s Cup is part of our heritage. It is a national treasure that we share with the world. Even as I spoke the words, I heard the irony. About 80 percent of my audience was Asian, and the bulk of that, Chinese-American. The USA in the 21st century may be rooted in Yankee Doodle Dandy, but the Facebook generation(s) is/are as far from that as a wingsailed catamaran is far from a wooden schooner with (advanced for the day) cotton sails. The organizers of America’s Cup 34 are aiming at nothing less than revolutionizing the leading edge of sailing. Just in time, perhaps. (And, China Team, hurry up and announce.) The kids . . .
Gotta hand it to them. No one fidgeted. When program head Will Fowler asked, “Before this contest, how many of you had ever heard of the America’s Cup,” not a single hand went up. 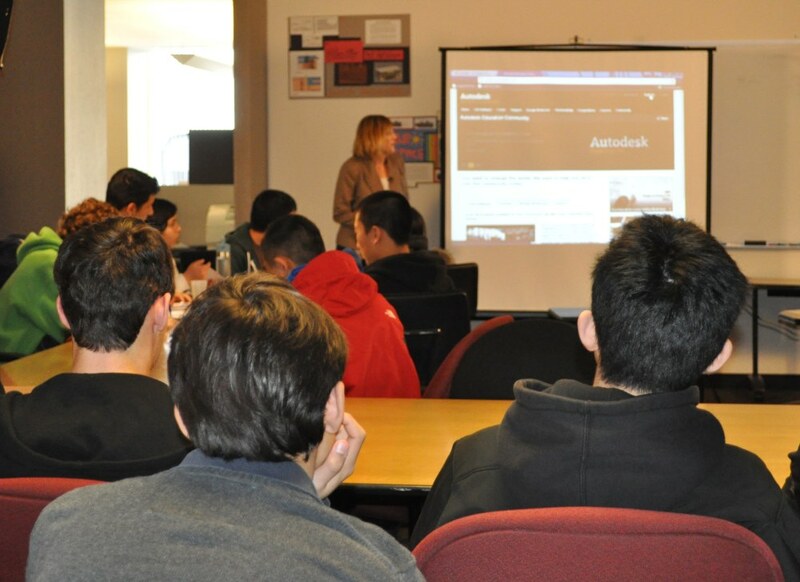 In the shot above, the students are listening to a presentation by Jenna Shore of AutoDesk, which is offering a $100 prize this year for the best use of AutoDesk Rivet Architecture software. The company gives this software free to students and educators, and a demo lesson was part of the day’s activities. Here is a different view . . . Overall first prize for the AFSF contest is a scholarship to the California College of the Arts’ Summer Pre-college Program in Architecture, described as a four-week intensive studio experience. Awards day is April 24. Below is the look of winners from a past year who were tasked with imagining an environmental learning center in the Golden Gate National Recreation Area. 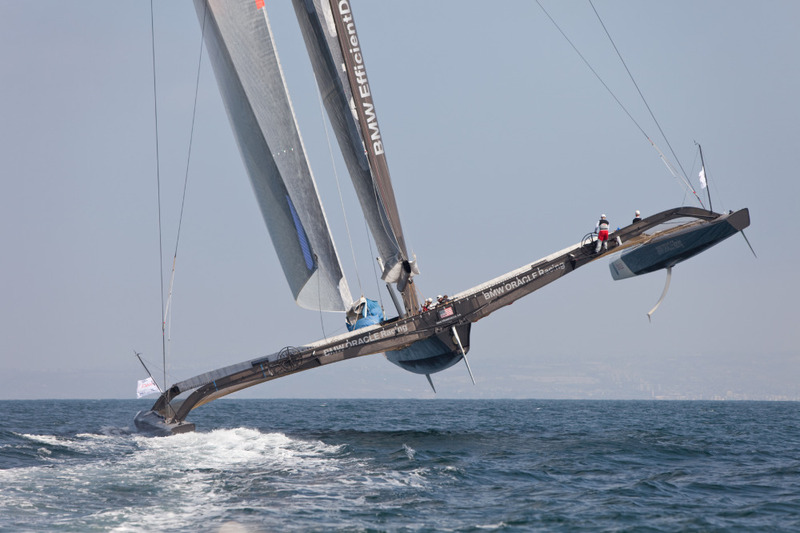 The Oracle Racing trimaran that won the America’s Cup in February, 2010 spent a long time in storage in Valencia. It’s likely to be a long time in storage here, too after its scheduled arrival through the Golden Gate early on Monday, February 28. But maybe, just maybe, there will come a day when we could see the hills of San Francisco in this shot, instead of an empty horizon. The Star Isfjord passed through the Golden Gate in the pre-dawn darkness on Monday and was closing on the docks at Pier 80, escorted by the tugs Patriot and Marshall Foss, circa 0700.